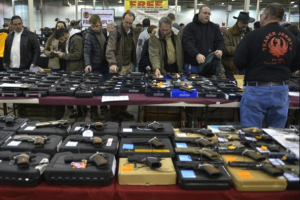 Last weekend at the ‘Nation’s Gun Show’ at the Dulles Expo Center in Chantilly, Virginia, attendance numbers were close to double what the promoters would have expected prior to the latest push by Democrats to ‘exploit‘ the Newtown tragedy to pass their radical gun-control agenda. This entry was posted in Gun Sales, Gun Shows, Virginia. Bookmark the permalink.